You are here: Home / Product Reviews / Babies & Kids / There’s A Fun and Safe New Trampoline Available in Your Area! There’s A Fun and Safe New Trampoline Available in Your Area! There’s A Fun and Safe New Trampoline Available! Attaining soaring heights on their backyard trampoline can quickly become every child’s favourite outdoor pastime. However, for parents watching over, trampolines can cause a great deal of stress especially when you catch your child’s head landing just inches from the frame, or toes too close to the springs. Parents of avid jumpers can now rest assured as there are many alterations being made to this traditional model that reduce these risks, by people who believe in putting your child’s safety first. These ingeniously designed trampolines have many safety improvements implemented into their makeup – virtually eliminating major hazards by removing the chances of contact with the springs or frame. Dr. Keith Alexander, a mechanical engineer (and father) designed the Springfree Trampoline with the intention of making it the world’s safest trampoline – years of research went into giving this trampoline a design that nearly eradicates those painful impact points completely. The springs of this trampoline have been replaced with flexible composite rods located beneath the jumping surface instead of surrounding it like the springs of traditional models – no more pinching, twisting or spraining. These composite rods also support a FlexiNet enclosure encouraging jumpers back into the ring should they jump too high or too far. Moreover, the new design implements a SoftEdge mat that is incredibly shock absorbent and the hard steel frame has been reconfigured both to rest under the trampoline, and created using more malleable, flexible material. This material bends with the jumper’s body however is also very strong and will support the entirety of the structure. Possibly the most innovative aspect of Springfree trampolines is that they have partnered with the tgoma digital game system, which uses smart technology to create a more interactive jumping experience by allowing users to connect to the internet. The pairing of fitness with interactive game play encourages children who are accustomed to playing on their smartphones to enjoy some physical activity while staying connected. Some of these games include Whatzat? – allowing children to use their imagination to create their own activities using the app. More structured games might include Math Hopper – introducing mathematics to primary school children, or Stickers helping the youngest of bouncers learn about shapes and sounds. This inventiveness engages the player, challenging them to work hard and maintain a healthier lifestyle by being active. With this new trampoline’s safety and gaming features, children can keep score, chart repetitions, and even set goals for exercises without constantly having to keep an eye on the frame, or the springs. 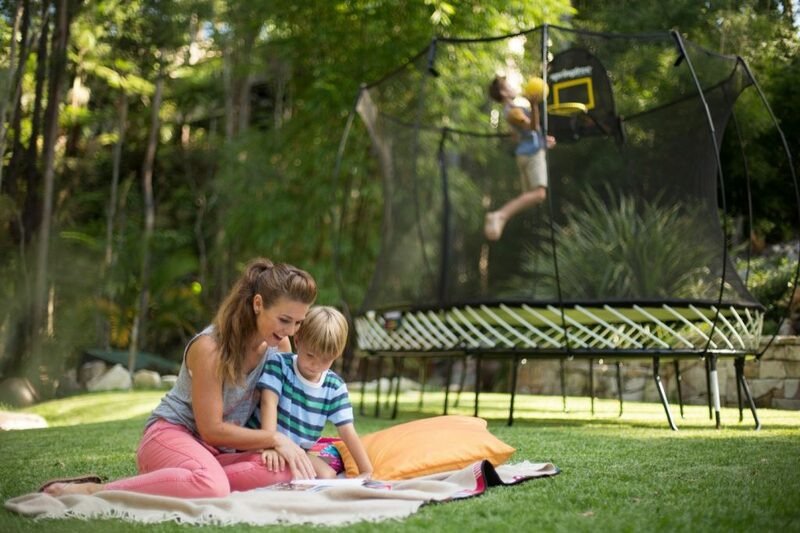 This world’s first smart trampoline has been awarded by the US Family Choice Award for safety along with others such as the Parent Tested Parent Approved Award and the Australian Good Design Award thanks to the addition of tgoma. This highly respected product is taking the market by storm and setting the bar for future trampoline models. If you’re looking for a safe alternative to a traditional trampoline, you can breathe easier – this one comes highly recommended by parents everywhere. Do you use a trampoline?